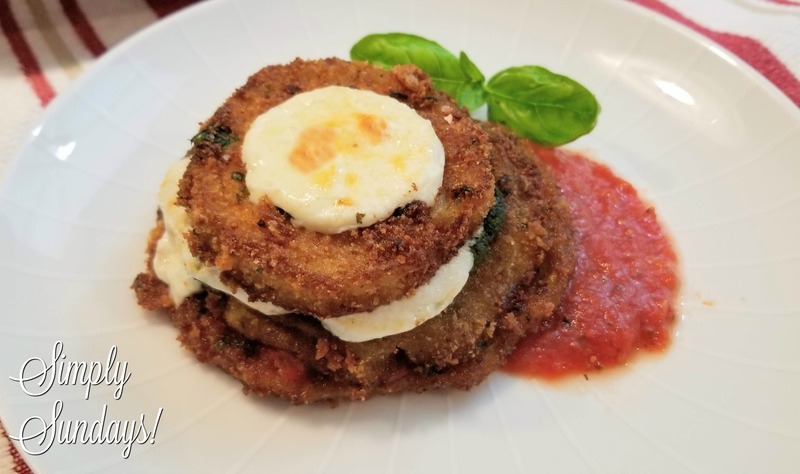 Eggplant Parm Stacks – Simply Sundays! What’s not to love? Ooegy gooey cheese melted over crispy breaded eggplant, yum! I made individual stacks one year for a holiday so they were easier to serve and they were a hit! Blot all of the salt and any accumulated liquid off of both sides of the eggplant, add the rounds to the breading station and we’re ready to start frying! Heat 1/2″ of canola oil in a large pan over medium heat. You’ll know it’s hot enough when you drop a few breadcrumbs in the oil and they dance like crazy! In my house, I have to stand guard over these fried little delights. My family steals my eggplant before I get them into the oven! Let’s get ready for eggplant stack assembly! Repeat, repeat, repeat until all of the eggplant rounds have been used. Into the oven we go! Heat 1/2 inch of canola oil in a large pan over medium heat; it’s hot enough when you drop a few breadcrumbs in the oil and they dance like crazy!